WHAT IS 10 AT 10? As of last year, 84 of the 3,180 almuni had given at least one $10 gift to support Skutt Catholic SkyHawk Appeal. Many others have supported the school by attending games, concerts, or other events. Some have paid tuition to provide their kids with the same quality Catholic education that they received at Skutt Catholic. Only 2% of alumni have given above and beyond to help support the needs of the Skutt Catholic SkyHawk Appeal – scheduled monthly giving. While we are grateful for the gifts that have been given, we have heard from a number of alumni who have been looking for ways to give back to the school, and 10 at 10 is an easy way to do so. 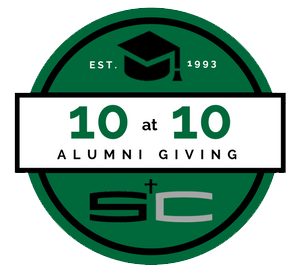 We are hoping to have at least 10% of our alumni sign-on to give a $10 (or more) monthly donation to support Skutt Catholic on an on-going basis. Imagine 318 (10%) alumni giving $10 a month. That’s $38,160 after one year. Imagine if 477 (15%) gave $15 a month. That’s $85,860 after one year. Imagine if ….. you get the point. Every gift makes a difference. Imagine what could all be done because of the alumni alone. 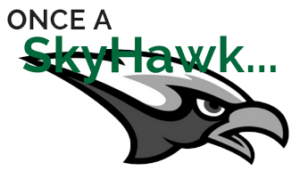 ALUMNI GIVING – SUPPORT YOUR SKYHAWKS! 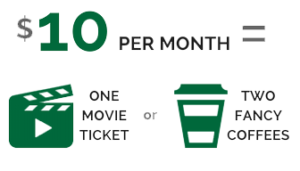 Support Skutt Catholic and become a 10 at 10 member and be a part of the 10%+ of alumni who are giving $10+ per month. If you have other giving interests or would like to support a specific fund, please visit Skyhawk Appeal page for more giving opportunities. Visit our FAQ page for answers to commonly asked questions about giving or contact Anthony Schenk at 402.333.0818 or anthonyschenk@skuttcatholic.com. Homecoming week is a highlight for alumni each year! There’s no better time to reminisce about your glory days than on Moylan Field during the Homecoming football game. Bring the whole family and reconnect with alumni for food, drinks, and another SkyHawk win! Skutt Catholic has a large following on Facebook and Twitter, and alumni are a big part of these groups. We also have a Facebook group specifically for Skutt Catholic alumni, which allows you to connect with other alum while quickly getting news that pertains to you. Alumni engage on skuttcatholic.com to check out information on upcoming reunions, view the latest alumni news, find out about upcoming events, and more. Find out what our SkyHawk alumni are up to on in Our Legacy magazine – designed specifically to keep our SkyHawk family in touch with each other and the progress of our beloved school. Click HERE to see our latest issues. In addition to Homecoming, our alumni like to make their rounds at a number of other events during the year. While you’ll occasionally see a single alumnus around campus, groups of alumni show up for events like Angel Flight, Benefit the Birdie Golf Tournament, or HawkWalk.